Now just days away from the December 11th expiration of a short-term Continuing Resolution (CR) that has been funding federal activities since the start of the current fiscal year on October 1st, Congress is feverishly working to reach agreement on a long-term Omnibus spending bill that will fund the federal government through the remainder of the fiscal year. Included in the CR, which was approved in late September, was a short-term extension of the EB-5 Regional Center Program, which also is set to expire on December 11th. 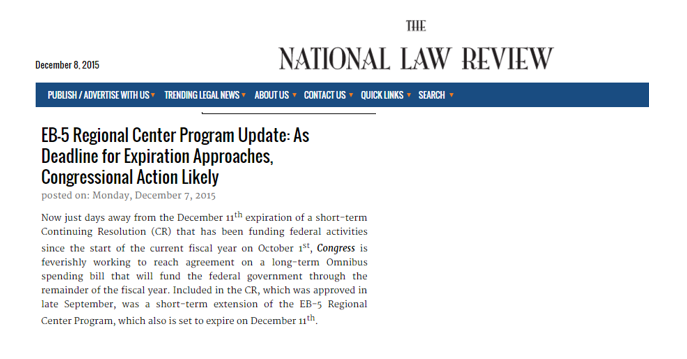 Supporters of the EB-5 Regional Centers are currently working to achieve a long-term reauthorization of the program. Key contacts on Capitol Hill involved in the negotiations indicate that a reauthorization and comprehensive reform of the EB-5 program discussed below may be included in the Omnibus spending bill that Congress could consider this week. However, another possibility that appears increasingly likely could be a simple, “straight” extension of the EB-5 program – free from any substantive policy changes, with the extension tied to the length of the Omnibus. In that scenario, Congress could work toward negotiating a reauthorization and reform measure with policy changes that could be enacted before the expiration of the straight extension.